mgrogan 170 2.8 Bio/Psych Male OH 2008 Waitlisted then accepted Accepted offer. NYCbound35 169 2.9 Biology Male No NY 2011 Waitlisted then accepted Hello 150k in debt! hannah87 168 3.9 Psychology Female No NY 2010 Accepted $25k/year! attending. Deposit made. revolution724 168 3.6 3.6 English MA Accepted Accepted by status checker 3/30/09. Plan to attend. Reukai 167 3.4 3.5 General Biology Female No CA 2011 Applied I keep forgetting I applied here. ejf11 167 3.4 3.4 Philosophy Male No 2008 Applied late in the game here. Emac 167 3.1 3.3 Political Science Female No MD 2010 Rejected Rejected 3/24; I thought I would be waitlisted, but was flat out denied. BigAristotle 166 3.2 3.2 Political Science & Philosophy Male No TX 2008 Waitlisted then accepted Withdrawn, decided I didn't want to live in NYC again. erikaseven 165 3.5 3.1 Psychology Female No MA 2008 Waitlisted then rejected Found out via random online status check, 6/12. Peace! barracudasix 165 3.5 No Domestic 2010 Waitlisted WL both cycles. mohanster 165 Computer Science Male No International 2012 Accepted $15000/yr. Attending!! greenh 164 3.9 3.9 Political Science Female No FL 2011 Waitlisted Took myself off the list before a decision was made. emmonsj 164 3.9 3.8 Secondary Education Male No OR 2009 Waitlisted Declined to accept spot on waitlist. Jason321123 164 3.7 3.7 English and History Male Yes TX 2010 Rejected Surprised by this rejection as well. sweatervest 164 3.3 3.3 History and English Female No FL Rejected Whateva. dreamofNYC 163 3.9 3.8 International Studies Female No NY 2014 Accepted No $. tgibson89 163 3.2 3.2 Philosophy Male No TX 2011 Rejected Oh well. red52 163 3.2 3.2 Pre Law Male No CA 2013 Waitlisted P/T - hopefully I get an offer eventually. Not surprised though. scram202 162 3.8 3.8 Liberal Arts Male Domestic 2012 Waitlisted then accepted ATTENDING!!! Terp2008 162 3.7 3.8 Psychology Male No MD 2011 Waitlisted Not impressed. pammy1985 162 3.6 3.3 Legal Studies Female No NY 2009 Waitlisted then accepted Yaaayyyyyy!!!!! Attending! DSTned4Law 159 3.3 3.2 English Female Yes NY Waitlisted I withdrew. Conan 159 3.3 3.1 Pharmacy Male No NJ 2008 Accepted Applied PT. Asked for deferral of admission for 1 year, which was granted by the admissions office. KPUSN07 156 2.7 2.7 VA Waitlisted HOLD status x 2.
legallyblonde5989 155 3.8 3.8 Journalism/French Female No MO 2011 Rejected my dream school. got rejected on my birthday :( cryfest. lostg4ever 155 3.3 3.6 Political Science and History Female Yes CA 2014 Accepted woot woot! SecondTimeAround 153 3.6 3.6 English Male No 2007 Accepted P/t program. Applied as transfer. 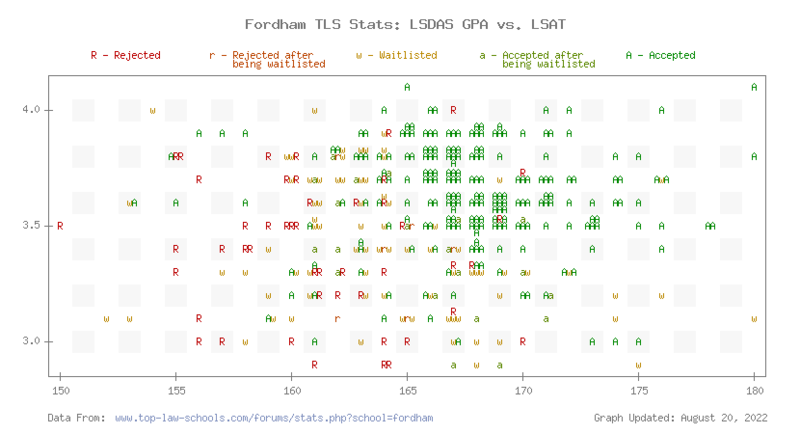 Be sure to check out the TLS Profile on Fordham Law.